with x the position within the play. Real backlash behavior is obtained by choosing low stiffness and damping values inside the play and choosing high stiffness and damping values outside the play. 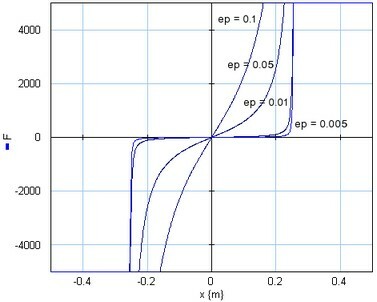 The parameter ep determines the smoothness of the force curve that is obtained. A larger value (> 0.01) makes the force change gradually when the position reaches the play boundaries. A smaller value (< 0.001 ) makes the force change abruptly. This is shown in the figure below. A good starting value for ep is 1e-4. Both terminals of port p (Translation).